Historically, Ethiopia has been recognized as the birthplace of coffee. Ethiopia is located in the horn of Africa and is bordered by Somalia to the Southeast, Djibouti to the east, Kenya to the south, Sudan to the east, and Eritrea to the northeast. It occupies the high plateau region between the Nile plains of the Sudan and Eritrea. Ethiopia is one of the largest countries in Africa with an area of over 1.13 million square kilometers. It has a rugged topography with altitudes ranging from around 100 meters below sea-level in the Danakil depression to 4,600 meters above sea-level in the Semien Mountains. The Harrar region lies in the Eastern Highlands of Ethiopia. As one of the main growing regions in Ethiopia, Harrar has a reputation for producing distinctive wild-varietal Arabica. Once picked, the coffee can go through a variety of milling processes. Harrar beans are usually natural processed coffees, which produces the distinct berry notes it is most recognized for. 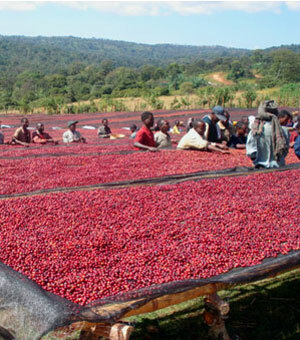 Ethiopian Harrar can have a strong dry edge, winy to fruit like acidity, rich aroma, and a heavy body. In the best Harrars one can observe an intense aroma of blueberries or blackberries.